Posted July 14, 2014 by Eric Graham . I analyze multiple websites on a daily basis with the primary focus of determining what changes, if any, are needed on a website to help elevate search rankings, but also to assess and evaluate a business’ local presence on the SERPS (Search Engine Results Page), particularly Google. I am always a bit amazed at the depth of the amount of needed changes a website needs to make to start the process of ranking higher. But I am equally amazed at the local presence many businesses have, or in this case don’t have. About 95% of the businesses we work with are what we would call a Local Business, in that their service or product is really only available to people who are located in or around the physical location of the business itself. Your local oil change shop is a Local Business in that they are trying to attract local consumers to bring their automobile in for an oil change. Amazon on the other hand, is not a Local Business in that they are trying to sell their products and appeal to a global audience. Global businesses have a different set of SEO challenges altogether. One of the most effective ways to generate SEO “juice” for your local business, is to essentially “localize” your business across the internet. What this means essentially is that you want your business listed in not just local directories, but high quality and authority local directories. Examples include Yelp, Yellow Pages, Angies List, BBB, Foursquare, and there are many others. In the SEO world these directory listings are also called Citations which Google uses to help determine which sites are of value, and consequently which sites will rank higher than others. Google looks at the quality of the Citations (Local Directories in our case), the quantity of quality Citations, but also the consistency of Citations. 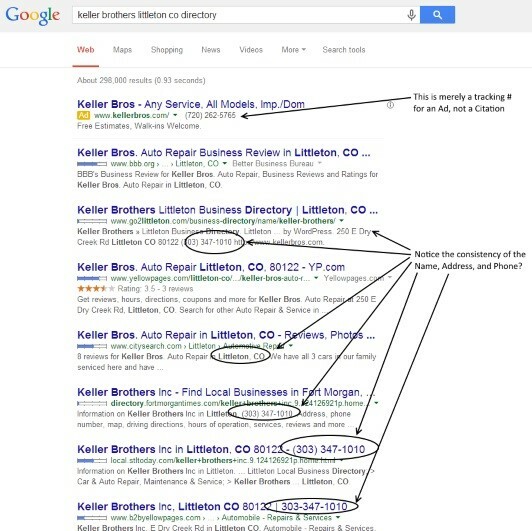 And by consistency, I mean that your listings should basically be identical across all Citations and Directories. The most important of which is what is referred to as a business’ NAP, or Name, Address, and Phone number. And I cannot tell you how many times I come across companies whose NAP is inconsistent at best. One directory site has a phone number of “X”, and on another directory site they have a phone number listed as “Y”. It may seem intuitive at first glance, but it’s very common to change a phone number or accidentally enter the owner’s cell phone as the primary phone, maybe a Fax number was accidentally entered, or maybe the business moved and has a new address altogether. Or maybe you have hired a company who does not have your best interests at heart who is making listings on your behalf. So what are you to do? Note that in every listing that the Name, Address, and Phone is identical…or consistent. Google does not penalize for Bros. over Brothers. 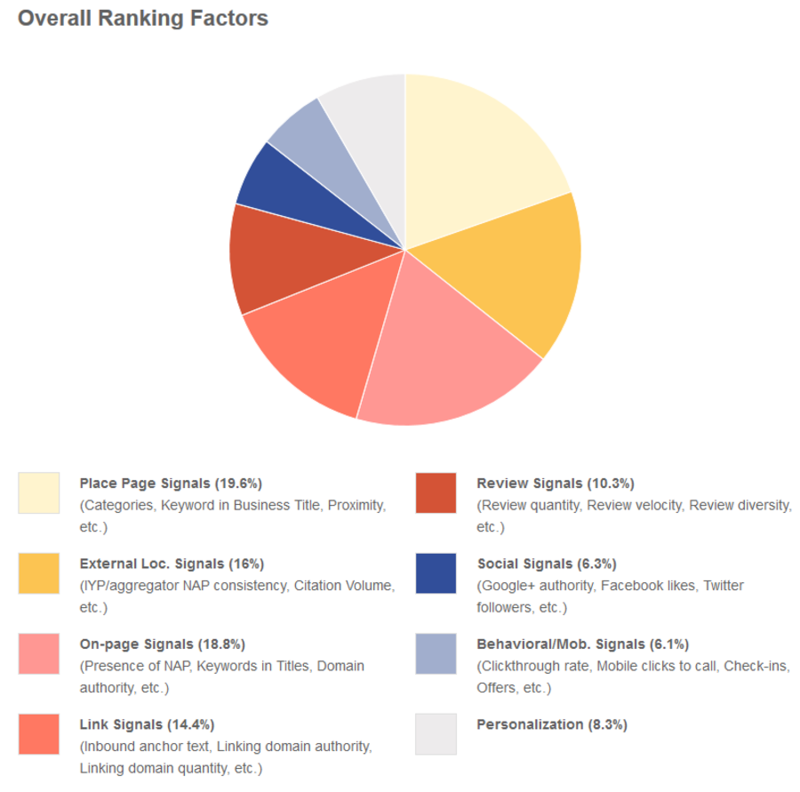 Here is a breakdown of the ranking factors. In conclusion, there are many things you can do to help elevate your local SEO rankings including getting more reviews, staying active on social media, and optimizing your website, but never overlook the fact that inconsistent directory listings might be harming your rankings without you even knowing it. If you need further proof, here is an infographic from Search Engine Watch that illustrates this and many other local factors. Happy Localization!